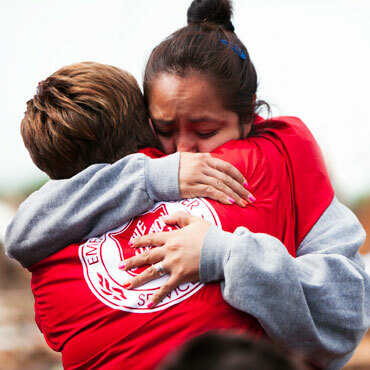 The Salvation Army, an international movement, is an evangelical part of the universal Christian Church dedicated to serving the poor, destitute, distressed, and hungry by meeting both their physical and spiritual needs. It has a presence in more than 100 countries, the largest of which is the United States where it has a presence in 5,000 communities. The organization also provides disaster relief and humanitarian aid in times of crisis. It operates homeless shelters; provides outreach services to the elderly or ill; offers financial assistance; helps to rebuild homes and boats; and provides clothing and domestic items to those in need. The Salvation Army has 110,000 employees worldwide (66,000 in the U.S.). Domestically, the organization operates rehabilitation programs, homeless hostels, general hospitals, maternity hospitals, specialist hospitals, addiction programs, children’s homes, homes for the elderly, and mother and baby homes. Because of its wide range of initiatives, both foreign and domestic, Salvation Army employees generate a vast amount of information. The challenge facing the Salvation Army’s IT department was to find a way for employees to access files from the internal network from mobile devices, and share them outside office users. With FileCloud by Tonido, Salvation Army employees are now able to share links, large files, and folders with users who need instant access. The Salvation Army selected FileCloud because it provides secure access to internal network files, and controls including audit logs. Prior to committing to the FileCloud solution, the Salvation Army reviewed Box, DropBox, and Copy. said Jin Chong of the Salvation Army. The key reasons the Salvation Army selected FileCloud included: local and on-premise storage; fully functional free trial; active development; no modules or plugins needed for core functions; a price point that fit within the company’s budget; personal and friendly support; and response during the presale and post sale process. To sign up for a free trial of FileCloud, please register for free 14 day trial.